Our outreach to the children in the community continues to be a success because so many of you care. Our goal was reached. Thank you for supporting this part of the mission. The photos are just a few of the children from the local community, Binunga Village, that Urukundo through your gifts are supplying basic needs for primary school. We continue our hope to fulfill our commitment for the poor in 2012. Here are some of the community kids we help to gain an education through our love and support. Remember them and others in your giving. You do make a difference. This year's fund for Orphans and the poor children of the community is far behind last year's gifts. Last year we were able to send 340 children to primary school thanks to your generous support. These children would not go to school without your love and gifts. The amount needed to supplement what the government provides is $15 USD per child per year. This purchases a uniform, exercise books, pens, a book bag, flip flops and a jacket. Please help so that no child is disappointed and consider supporting Urukundo Foundation's goal to provide an education for as many children as possible. Thank you. Gifts for Education should reach HMR as soon as possible - the school year begins in January. Headlining the month of September and it is difficult to decide which event in our busy month should be the headline! It is that time of the year when our project becomes the community children living in poor circumstances. If you remember - and even if you don't - last year we were able to send 340 children to primary school thanks to your generous support. These children would not go to school without your love and gifts. The amount needed to supplement what the government provides is $15 USD per child per year. That $15 provides a uniform, exercise books, pens, book bag, flip flops and a jacket. Urukundo Foundation's goal is education for as many children as possible. The need to read and write is a priority. Pre-school & primary school are where the foundation is laid. Investing in education is investing in a better life. Please partner with me so that Urukundo can continue caring for children who deserve a brighter future. This is the best gift to Rwanda's children you can give. Gifts for education must reach HMR by December 15th to be included in the December wire transfer, and for us to provide the items needed to insure continuing education for the 2012 school year. The school year begins in January. Please consider adding EDUCATION FOR A RWANDAN CHILD to your Christmas gift list. We believe that child development is dependent on love, care, and spiritual discipleship. Jesus said: Mark 10 verse 14 “Let the children come to me, don’t stop them! For the kingdom of God belongs to those who are like these children”. This is our inspiration to help the children in our care and community by equipping them with Christian values, love, and education. December is the month for giving gifts in Jesus' name. What better gift than the gift of EDUCATION to a child in need? This is surely a gift that keeps on giving. Every child deserves the opportunity to learn to read, write, and make good decisions for the future. Your gift of $15 can begin to make this possible for another child who has been homeless or abandoned. Please give from your heart, knowing you are making a difference in the life of a child. Thanks to all of you, our scholarship drive was amazing. 330 orphans and children of very poor families are going forward in education. Below are just a few of the kids you are helping to have a better future. Finish construction on the Multi Purpose Center "HOPE HOUSE"
Ceiling boards and tile for the floor are essential. We are a faith ministry and in faith we know God is in Charge. Our mission outreach after feeding, clothing, lodging and educating the Urukundo kids is to the aid children in Rwanda. The update for scholarships given by you will be in the next newsletter. It is not too late to give the gift of a scholarship. The month of Thanksgiving is here and Urukundo and I have so much to be thankful for. We are counting our blessings (42 children) and are thankful to our Lord for each of those blessings. I thank you for you have been faithful in supporting this ministry. That support not only feeds and cares for the children who live in our village but provides education for the very poor, vulnerable children throughout the region. A donation of just $15 makes a big difference. Yes, $15 allows us to provide the necessary items needed for a child to receive an education and a better start for a promising future. If you are able to, please consider adding an extra dollar ($16), since prices have gone up in Rwanda, like the rest of the world. Last year we were able to provide educational scholarships for 329 impoverished children giving them hope in Kigali and South Province. This year we are nowhere near our goal - yet. Don't delay, do it today! Make a difference in our world - yours, mine and the children in Rwanda. LETS KEEP THEM IN SCHOOL! We are currently in a holiday and looking forward to Christmas, the time we set aside to celebrate the greatest gift ever given. The birth of our Lord Jesus. That gift can never be improved upon. 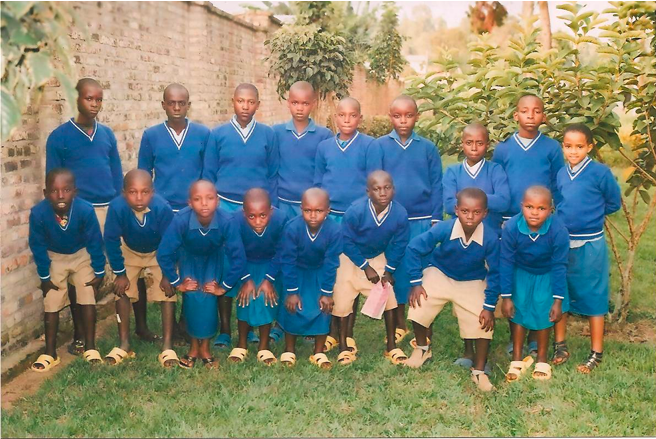 Last year we sent 329 Rwandan children outside of Urukundo Village to school for 2009. Your donations made that possible. We can do it again and, perhaps, even do better. A gift of $15 will provide the necessary equipment for neighborhood poor children and orphans to go to school. This includes not only access to school, but also their supplies and school uniform. We are asking those who can to add an extra dollar this year ($16) because like every where else prices have gone up. The extra dollar will help us meet our promise to the vulnerable kids in Rwanda. We do need your help and cannot do it without you. 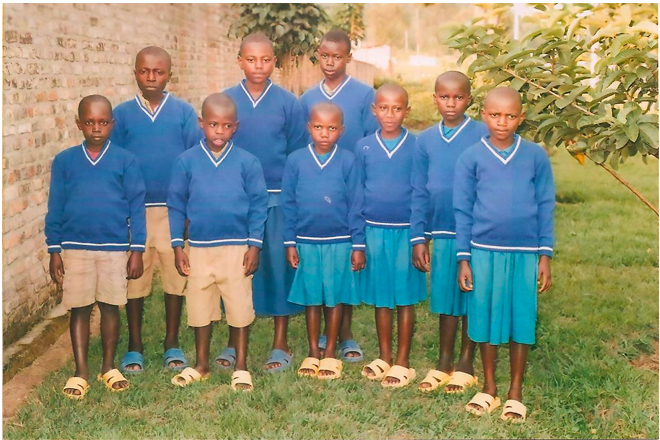 Consider putting these children on your gift list and make a donation so that a child can get an education in 2010. What better gift can you give to each other than a gift that keeps on growing? From your kindness, it travels to Africa and is a gift to me and the kids at Urukundo Village. You make it possible for us to help our friends and neighbors send their children to school. This is surely a gift worth giving. Sign up with your email address to receive our monthly newsletter and updates.